A priest and church are mentioned in Domesday Book. 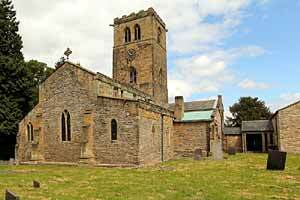 St Mary’s is a large cruciform stone building in Transitional, Perpendicular and Decorated style. The oldest part is the north arcade of three bays which is Transitional, but with two Norman-looking corbel heads. 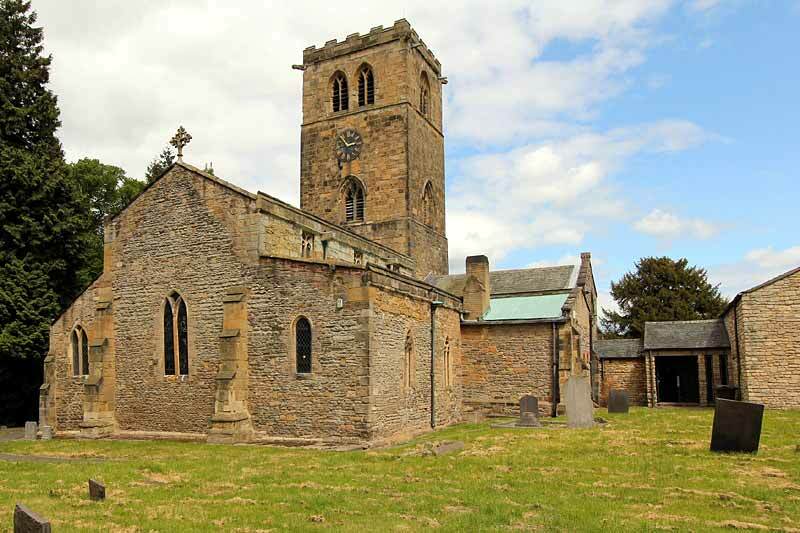 The church consists of a chancel, transepts, nave with an arcade of four bays, aisles and a tall embattled central tower containing a clock and six bells (replaced in 1992). The south arcade is of the 14th century with octagonal piers. The much-restored chancel was enlarged in 1476 when Sir Robert Clifton founded a chantry college. It has a good flat timber roof with bosses, plain triple sedilia, a piscina and a south door dated 1632. Restorations have been by Cottingham in 1846, by Hodgson Fowler in 1873-4, who added four oak screens, by Bodley in 1884, by G G Pace in 1965-5 and by Ronald Sims in 1975-9, when the church was re-ordered with the sanctuary under the tower and the chancel arch glazed to form a separate chapel. Sims recovered the altar stone from the Sacred Mission at Kelham. It rests on the pre-Reformation altar. The superb Marcussen organ (1973) has acoustics designed by David Jones. The Clifton family is recorded in several monuments. In alabaster is a knight (Sir Gervase?) of the late 14th century, Dame Alice Neville on a tomb chest, also late 14th century, and Sir Gervase (d1587) and his two wives also on a tomb chest. On a large monument to a later Sir Gervase‘s first three wives (he had seven) is a hideous glimpse into a charnel chamber with bones and skulls. In the chancel is ‘a very rare device’, the coat of arms of Christ surmounted by a spitting Jew. In the south transept is a flagstone for Joseph, the Black Prince (d1685) who was a black family servant. On the entrance to the porch are his initials IP. Outside above the west gable is a rare pre-Reformation crucifix cross.